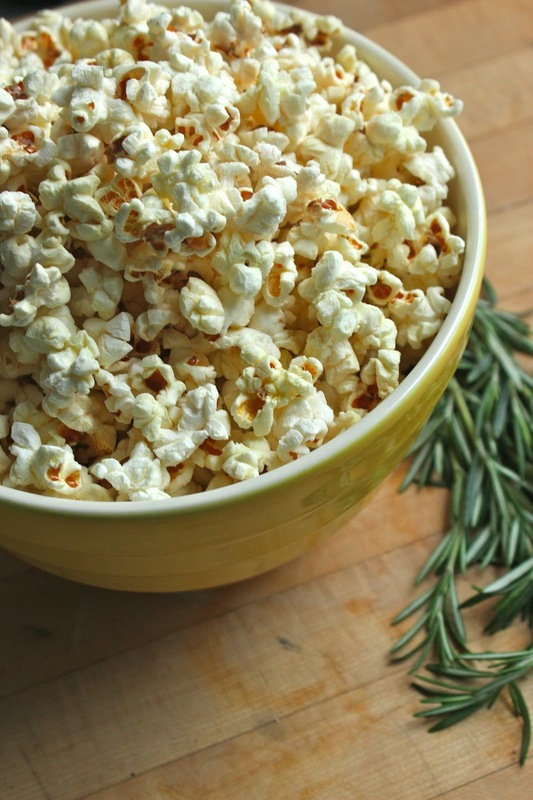 Step away from the microwave popcorn. It's gross and makes the roof of your mouth feel weird. Also, "turn your fingers orange" is not an actual flavor. Okay... end rant. Real popcorn is where it's at. 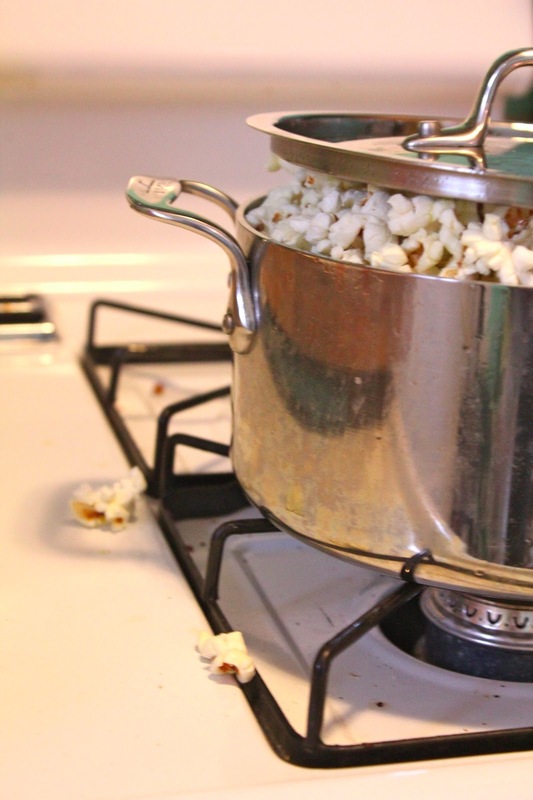 Cooking on the stovetop takes 5 minutes, which is the same amount of time you spend waiting for your inconsistent microwave to potentially burn/uncook half the kernels. Cooking it yourself also opens up a world of flavor options. Various grated cheeses, spices galore and in this case, delicious Rosemary Olive Oil. Start in a heavy-bottomed pot and heat oil over medium heat. Throw in 3-4 kernels from the beginning and cover. When you hear those tiny pops, you know the oil is hot enough. When the oil is hot, I actually remove it from the heat when I add the remaning kernels and wait about 20-30 seconds. 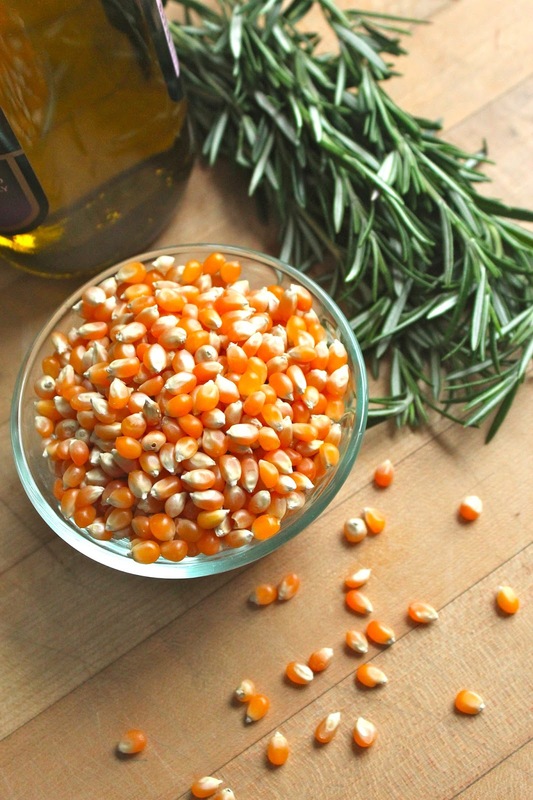 This ensures you don't burn your kernels from the outset. Return to heat and cover. Now shake it, shake shake shake it (like a polaroid). Well, as much like a polaroid as you can while keeping on the burner. If anything make a crapload of noise. The excitement builds. Your smelly-good snack is almost here. Smells like good movies. Serve with a sprinkling of salt and side of dental floss. Once you've had the real stuff, you'll never go back to the microwave. Heat olive oil in a heavy bottom pot over medium heat. Add 3-4 kernels and cover. Once kernels pop, remove from heat and add remaining corn. After 20-30 seconds, return pot to heat and cover; shaking frequently. Cook until there are several seconds between each pop. Sprinkle with salt and serve hot. YUM!!! I love this. Why did I never think to do this? It is sooooo good. Any flavored oil would be tasty. I'm thinking chili oil may be my next experiment to keep things spicy! !